In his books and talks, TED fellow Will Potter draws our attention to subjects that Big Brother would prefer us not to see. He writes about industrial farms. He speaks out about private prisons. He posts about abuses of power. To unify all his undertakings, he needed more than a business card. He needed a visual identity. 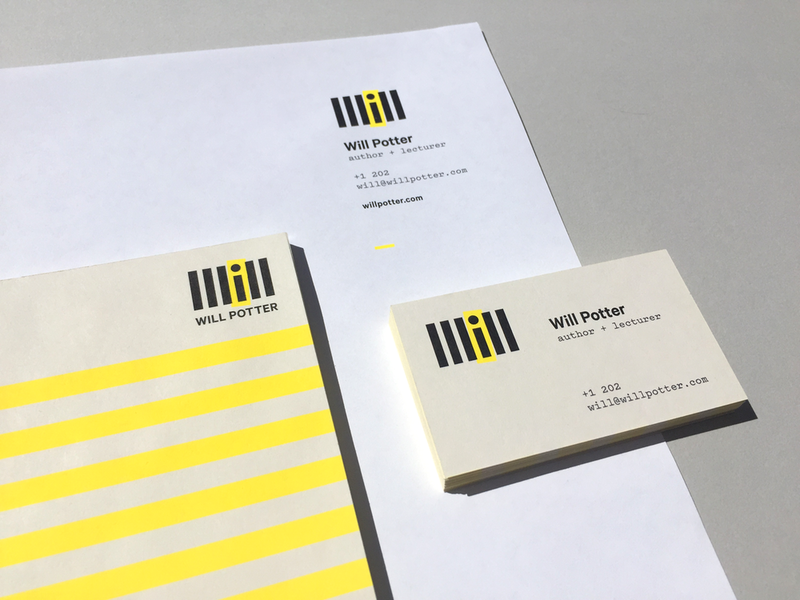 Like a cattle brand from Will’s home state of Texas, a strong identity system is a sign of quality. It’s a sign that any message bearing that mark comes from a source you can trust. To develop Will’s mark, I considered the differences between authoritarians and authors. Authoritarians want you to fall in line; authors stand out. Authoritarians redact information; authors highlight it. I used thick black bars to spell Will’s name like lines of redacted text. Then a slash of yellow highlights the dissenting voice in the crowd.